Christie’s Auction House sold this three painting series within 10 minutes to an anonymous bidder in November 2013. The oil on canvas painting features Bacon’s friend and artistic colleague, Freud. Sold in May 2012, this is the only one of four versions to be privately owned. The lucky winner of this auction took “The Scream” home for a cool $119.9 million after only 12 minutes of bidding between 8 interested buyers. This silk-screen printed piece was sold in November of 2013 after a telephone bidding war. The piece was only publicly exhibited once, and with a price tag of $105.4 million, this is one of the most expensive Warhol pieces ever. Sold in February of 2010, this bronze sculpture is the most expensive sculpture ever sold at auction. This piece was originally intended to be part of an exhibit at the New York’s Chase Manhattan Plaza. This orange sculpture, made of stainless steel and a mirrored finish, is part of a five-piece collection boasting balloon dogs of orange, blue, magenta, red, and yellow. 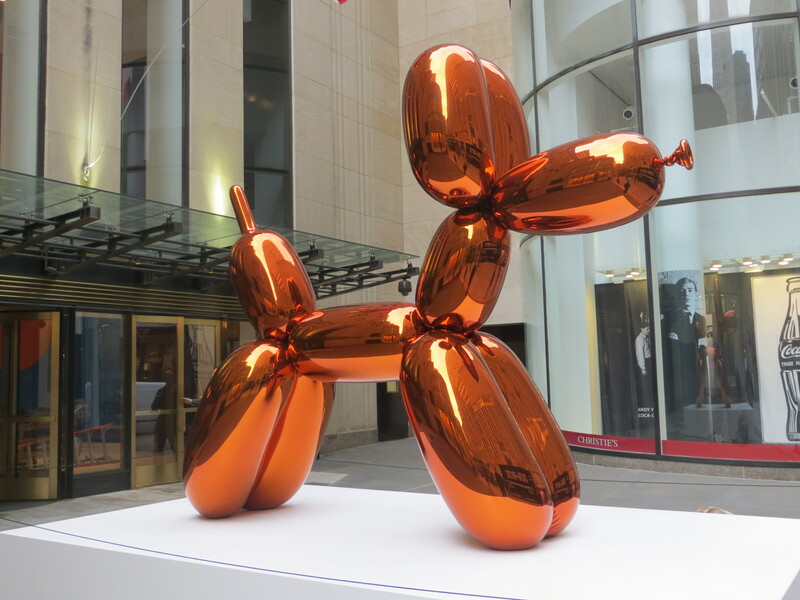 Sold in November 2013, Balloon Dog helped Koons set the record for most expensive price for a living sculptor. Sold in December 2007, this 5,000-year-old white limestone sculpture measures just over eight centimeters (3.25 inches) tall. The tiny sculpture is extremely rare due to its age. Sotheby’s Auction House explained that this figure is one of the last known pieces from the Mesopotamian era, the dawn of civilization, which has remained in private collection. Sourced from the Democratic Republic of the Congo, the feature yellow diamond, known as “The Golden Giant”, is more than 407 internally flawless carats. The center stone is complemented by 90 white diamonds, which bring the total weight of the necklace to 637 carats. This necklace was sold at auction in 2013 in Singapore, a country famous for it’s ultra wealthy residents. In June 2013, this vine scroll and palmette carpet sold for $33.7 million. The carpet dates back to the 1700’s, where it is thought to originate from the Kerman Province, modern day Iran. Selling in June 2014, this magenta one-cent stamp dates back to 1856 British Guiana. This stamp is currently the most expensive stamp sold at auction. This piece has set the world record for most expensive stamp three additional times: in 1932 it sold for $32,500, in 1970 for $280,000, and in 1980 for $935,000.